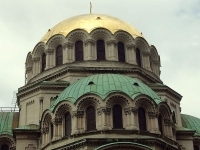 One of the finest examples of 20th-century architecture in Sofia, and one of the most iconic buildings in the city, the magnificent Alexander Nevsky Cathedral was built between 1882 and 1912 to honour the Russian soldiers who died fighting to liberate Bulgaria from Turkish rule in the war of 1878 under Tsar Alexander II. It is one of the biggest cathedrals on the Balkan Peninsula. The famous religious monument is situated in the centre of Sofia, on the tree-lined square of the same name, which also contains the Monument of the Unknown Soldier. The impressive five-nave basilica houses an interior just as splendid, with mosaics, stained glass windows, marble and woodcarvings as well as frescoes that cover the walls and domes. The underground crypt houses the Icon Museum featuring icon paintings from across the country that represents masterpieces ranging from the 9th to the 18th century. For those who fall in love with the Bulgarian icons, there is often a local artist who paints and sells replicas in the little museum gift shop. There is also a souvenir market very close by. The cathedral is an active place of worship, so services and events may disrupt sightseeing, but entry to the main building is free. Address: pl. "Sveti Aleksandar Nevski", 1000 Sofia, Bulgaria.